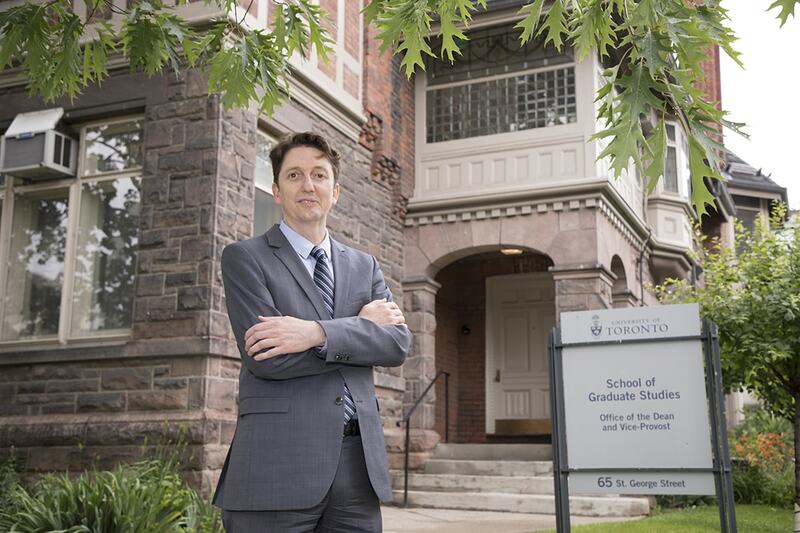 Associate Professor Joshua Barker has been appointed dean of the School of Graduate Studies (SGS) and vice-provost of graduate research and education. The five-year term begins July 1, as he transitions into the role from his current position as vice-dean, graduate education in the Faculty of Arts & Science. He will be taking over from Professor Locke Rowe. “As outgoing vice-dean of graduate studies in the Faculty of Arts & Science, Joshua brings a great depth of experience and understanding to this important role,” said Vice-President and Provost Cheryl Regehr. “The School of Graduate Studies provides crucial professional and personal opportunities for our graduate students. As vice-dean, Barker was known for consulting widely with students and faculty. He developed a student-centric strategy to improve graduate student experience by increasing graduate student funding over three years and establishing the Milestones and Pathways Program, which provides support for discipline-specific graduate student professional development. Barker said he sees SGS as having three main functions: acting as a service provider for grad students, a resource for key information for all graduate activities at the university, and an innovation hub for graduate student experiences. Barker said it will be important to involve students in developing and planning new SGS initiatives. Barker has an extensive research background in urban anthropology, science and technology studies, and political anthropology. His research focuses primarily on Indonesia, where he has conducted ethnographic field research on a range of groups, including: the police and civilian guards, information technology engineers and entrepreneurs, and city-level journalists. As for advice on the new role, Barker said dean Rowe has been a valued resource.